No matter what else happens this week, I’m going sailing. On a global level it seems a bit frivolous, with everything else that’s going on. But I can’t fix the world, so instead I will join my friends in another celebration of our shared passion for one-design competition. The occasion is the Florida State Championship, a Snipe regatta in St. Pete, FL. Because it’s a qualifier for next year’s Western Hemisphere & Orient Championship, we get three days of racing. 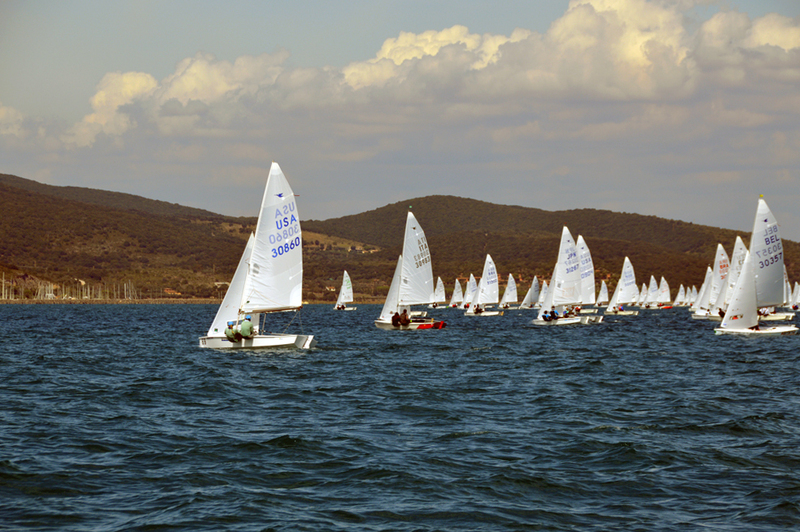 And with 20 boats registered from various fleets, the competition will be great. Now you might think that a simple weekend of Snipe racing is not worthy of a blog post, and in other eras that would’ve been very true. As a life sport, sailing ebbs and flows through our schedules as time and opportunity permit. This fall (beautiful as it has been) has been an ebb in my racing schedule, which actually felt quite appropriate after the effort and time that went into preparing for, sailing in, and recovering from the Snipe World Championship in Talamone, Italy. Since that event is now vying with my all-time favorite regatta (the 2006 Yngling Worlds in La Rochelle, France) for the top spot in my memory banks, it was good to have a break afterward to savor, consider, and remember. One of the many things I appreciate about the Snipe class is the range of sailing opportunities it provides. One regatta inspires me to fly a third of the way around the world to compete against an internationally impressive fleet of 83 boats. The next is a “local” event—at least for most of the twenty teams. In either situation, the chance to catch up with old friends (and likely make some new ones) is as important as the results, which is how the Snipe class lives up to its motto: Serious Sailing, Serious Fun. This weekend, I’m leaning on several of those friends for the equipment needed to compete—and once I get there, I’ll likely need quite a bit of on-site support too. I have no doubt that I’ll get a chance to return the favor next summer, or the summer after that, when so many of my southern Snipe friends travel to the northeast to race against the locals up here. I like to think that this kind of support—no quid pro quo, no price for favors, just a genuine interest in helping our fellow sailors—sends a quiet message of how we can all make each other’s lives better. Maybe that counteracts some of the hate we’ve seen elsewhere this week; it certainly is the best way to celebrate the life of a local Snipe friend, John Lally. I can’t fix the world, or bring John back, so I’m going to go scratch my sailing itch.